If you have some sanding to do around your home then an orbital sander can be a very good buy. They work well on small jobs or even on the finishing of floors after the drum sanding is done. The orbital sanders provide a smoother finish then if you were using a belt or flat sander. From my experience the flat sanders will leave some swirl marks on the wood, which you often have to sand out by hand. Belt sanders are ok but do not always leave the wood as smooth as it should be. One thing about the orbital sanders is that they are easy to change the sanding paper, with the hook and loop system just pull the used one off and paste the new one on. Most orbital sanders will produce quite a bit of dust, so when applying your sandpaper to the disc be sure to match up with the dust holes on the bottom of the pad. Probably one of the best orbital sanders is the Makita B05041K, which is a five inch model and weighs about 3.1 pounds. With its rubberised grip the amount of vibration you feel when sanding is much less in comparison to other orbital sanders. Makita designed a handle for the front of this sander which gives you more control, plus the handle can be adjusted if your sanding in tight corners. It also has a variable speed control, which is a great idea as you can control the speed from four thousand to twelve thousand orbits per minute. With the 3 amp motor there is enough power for most of your sanding jobs around the home. So if your looking for one of the best in orbital sanders then this is it. As I have owned different Makita tools from drills to saws, etc. I can say that they are made to last. Makita also makes a cordless orbital sander, the LX0B01Z, which uses an eighteen volt lithium ion battery for its power source. It will last about forty minutes on low speed and twenty minutes on high, before needing to be recharged, having another battery is the best way to go. Also has a one touch speed control for three different speeds,1000,4500,11,000, and also a dust sealed switch for protection. The sanding pad is a five inch hook and loop design, and the kit for this sander supplies two batteries and the charger plus the dust bag. The Bosch 3725DEVS random orbital sander is also a very high quality tool. With a 3.3 amp motor that give it a little extra power. It also comes equipped with a speed control for sanding from four thousand to twelve thousand orbits per minute. This sander is one of the heavier at 5.1 pounds as most are in the three to four pound range, but with an extra handle on the front makes it easy to control. To reduce swirl marks on the wood being sanded there is a dampening ring built into it. This basically controls the pressure and speed that the pad spins at when making contact with the wood. Like the other sanders it has a dust collector attached to it. It is also designed to keep dust out of all critical areas, so should be able to last a long time. The Ryobi P411 one is an eighteen volt cordless battery operated random orbital sander. This one weighs in at three pounds and has a five inch sanding pad that gives out ten thousand orbits per minute, and also equipped with the dust bag. The one con about this sander is you have to buy the battery and charger separate. If you happen to own Ryobi cordless products then the batteries from them are interchangeable with this sander. If used for light sanding work then this is an excellent tool. The Porter Cable 382 is another orbital sander of excellent quality. It is designed so that dust does not get to the 1.9 amp motor, or into the sealed power switch, so it should last a long time. With an automatic speed control for starting to sand and slowing down, so you don’t get swirl marks on the wood. This model has less vibration then some others, thus making it easier to use over a longer period of time. It will spin up to twelve thousand orbits per minute, so for light to medium sanding it is an excellent choice. The Black and Decker model BDER0100 orbital sander is more for light sanding jobs. Weighing only 3.16 pounds it is one of the lightest sanders, so this makes it very easy to control. It will spin up to twelve thousand orbits per minute and with the random orbital motion it does leave a good finish on the wood. This is not too expensive a sander and is good enough for any small sanding around your home. Mastercraft makes a random orbital sander model number 054-8392-0. This is another sander designed for light work with a five inch sanding pad, and the hook and loop system for attaching the sand paper. It weighs two pounds ten ounces so is very light to handle, and for best results just apply light pressure while sanding. It does not have a variable speed control so best to start the sander after you have placed it on the wood. For light duty work and a low price tag this sander works quite well, as I have used one of these to do two church doors, and it did an excellent job. The Milwaukee five inch random orbital sander model is 6021-21. It has a 3.0 amp permanent magnet motor producing excellent speed and power. This model also comes with the variable speed dial controlling the seven to twelve thousand orbits per minute. With an electronic soft start there is less wear on its parts, and very little swirl marks so it will produce a smooth finish. The design adds control and comfort to the sander, and with a weight of 3.3 pounds makes it very easy to use. With a five year warranty this model should last you a while. The speed that the sanding pad moves is rated as orbits per minute OPM because the pad is oscillating in a random motion as well as spinning. Also there are some sanders that spin only on a fixed axis and these are measured in revolutions per minute RPM. When the sander is on the wood to be sanded it will slow down from what it is rated at. The power rating of these random orbital sanders is usually in the range of 2.5 to 3.3 amps. Some of these with a stronger motor may actually orbit and spin at a slower rate then others, so that’s something to check out when buying. The warranty on most orbital sanders is from 1 to 3 years and some up to five years, so there usually made to last for awhile. Most hardware stores will sell the orbital sanders, Canadian Tire has different models to choose from so you look and see how they feel. They also can be bought online, Amazon will have many different brands of them to choose from, and also with customer reviews to help in your choice to purchase. And often the online stores will have a more competitive pricing then your local hardware stores. For most people the choice of an orbital sander will depend on the job you will be using it on most of the time. If your going to use one at different jobs you do such as sanding a floor after drum sanding then a better quality sander would be the best choice. And if only doing light sanding around your home a less expensive model will be ok.
Also try to chose a sander that’s comfortable to hold, because if your using it for an extended length of time your hands and wrists can get a little sore. If you have the urge to buy a random orbital sander then Amazon is an excellent place to look for one. They sell the top end models and the not so expensive models. Usually you get what you pay for, so often a better rated model will be the best buy. Having a variable speed model is also a bonus as the sanding speed can determine just how smooth your sanding job will end up looking. One of the top rated is the Makita B05041K model, designed to do your jobs and last, as well as being one of the best in overall performance. If your thinking of buying a cordless drill for some of your projects around the home, then I hope the information here will help you out. 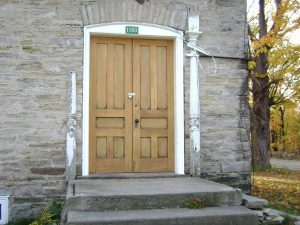 Cordless drills are probably a must for the home owner. When buying one go for the lithium ion battery type as they provide more power and are much easier to work with. I prefer the lighter drills if you happen to be using one for any length of time, and its always better to have two batteries. Just no fun when your screwing on a sheet of drywall and the battery dies, then having to wait half an hour for a recharge. Some of the better drills are Makita, Dewalt, Milwaukee,Porter Cable, Hitachi, Ryobi, and there is many more. Having used a Makita eighteen volt lithium ion during the syrup season for tapping I can say this is one drill I would highly recommend. I found it very easy and comfortable to handle and not to heavy at about 3.5 pounds. The newer brushless model eighteen volt LXT Makita is designed to run longer , with more power and speed plus a longer life before maintenance. 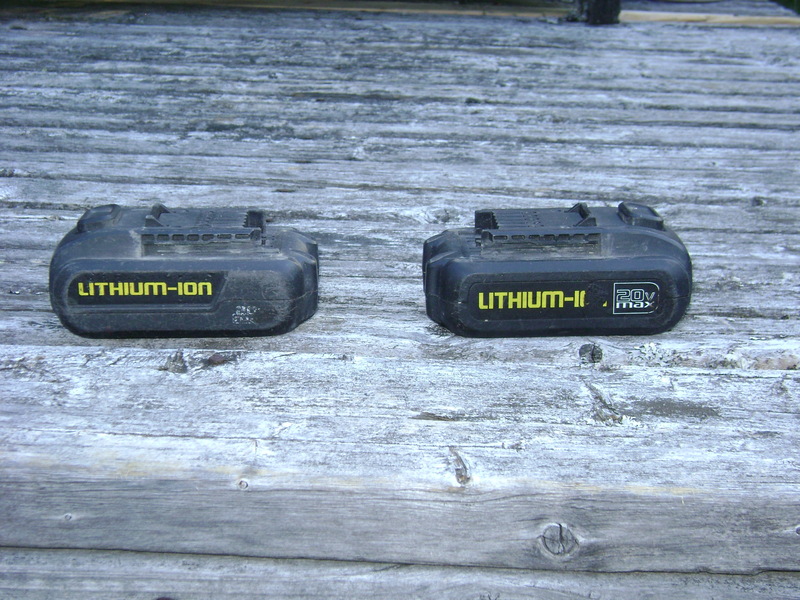 The two Lithium Ion batteries that come with it in the hard plastic case will take about an hour to charge before first using. I have not tried out any of the newer model drills yet, but from my experience with the older drills I would rate Makita as my number one choice to use around the home for repairs and most jobs. The dewalt line of cordless drills are also excellent quality as I have had the opportunity to use them a few times. With the dewalt if the last three numbers for the model end in a zero then the model is a drill driver, and if it ends in a five then it is a combination drill with the hammer function to use for drilling concrete. As an example DCD780 and DCD995. The seven eighty just being drill driver on the low end of dewalt drills, and the nine ninety five being both hammer and drill on the top end. The seven ninety five is the first of dewalts brushless motors and id designed to last longer and have less heat. The seven eighty, seven eighty five, and seven ninety five are for general purpose work, like putting screws in and lighter drilling. And the nine eighty, nine eighty five, and nine ninety five are dewalts heavy duty drills for harder drilling jobs. The Milwaukee cordless eighteen volt drills are also good quality if your looking for one to buy. There M18 fuel brushless four pole motor features rare earth magnets instead of brushes providing more power, cooler running, and a longer life span, plus lighter to handle. There M18 brushless combo drill weights in at three point nine pounds with the battery installed, so is light enough for overhead work and tight places. They have a long battery life but also take longer to charge so having two batteries in the kit is a must. With 24 clutch settings it is easy to adjust for screws or drilling, and also has the LED light on the front. Another model you might consider for around the home is Porter Cable. There twenty volt PCC601 lithium ion half inch drill sells for around a hundred dollars. So if your searching for a less expensive model give it a try. It comes with the two speed gearbox from 0-350, and 0-1500 rpm. and a keyless chuck for quick bit changes plus an led light on the front to see what your doing in dark places. The kit for this model has 2 20V Lithium-Ion batteries plus the charger and a couple of Philips bits with a storage bag. At a weight of only 3.5 lbs is an easy drill to work with for an extended period of time. The makers of Hitachi cordless also make a brushless drill. There DS18DBL eighteen volt lithium ion which has fifty percent more running time, increased power and durability and essentially no maintenance. This drill is 14% faster then the average 18V class of drills. With the brushless motor for more efficient performance, and will recharge the two batteries that come with it in about 45 minutes. If interested in a cordless drill for around the home you might wont to check one of these out. There are many excellent cordless drills on the market today, so is best to shop around to find one that suits your liking. Listed above are just a few , there is also Bosch, Ryobi, Craftsman, Rockwell, Mastercraft and many more. The price will vary depending on size and quality, so best to do some home work before purchasing. 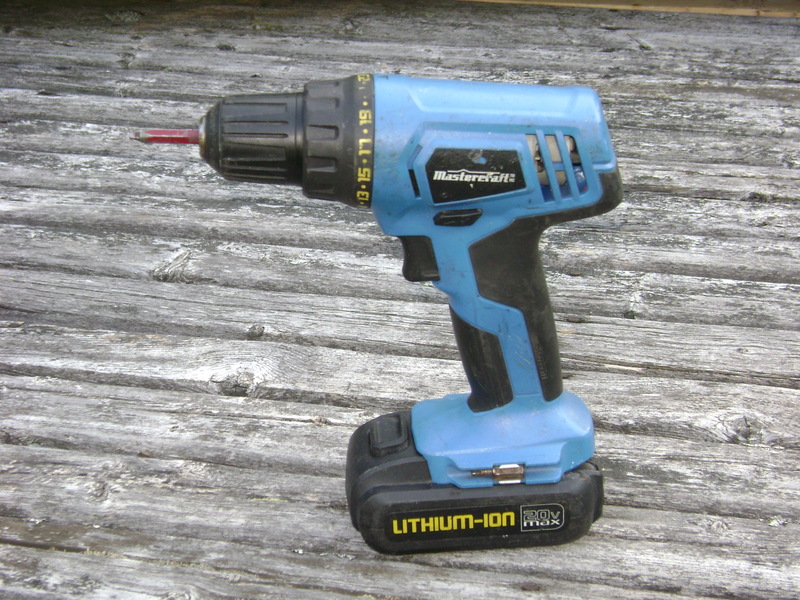 This is 20V Lithium-Ion cordless drill with an 11 position clutch. The kit comes with 1 battery and charger, 10 metal bits, a hole saw kit of 4 pieces from one and a quarter to two and one eighth, 32 screwdriver bits, and about 22 other pieces for a total of 66 pieces contained in a carrying bag. For what you get with this drill is a good price, and is able to handle many jobs around the home. The drill itself is light weight so will be easy to use, but having only one battery is bit of a negative. But then it does give you good value for what your buying. At the moment I have two twenty volt lithium ion mastercraft drills, and have been using them for about three years now. Reason I purchased them was the price, on sale for about eighty dollars at Canadian Tire. I figured for the price that if they didn’t last then I would not be losing very much. But after three years they are still running perfect, and I have put them through a lot of work from drywall to roofs. Also having one strapped to your belt all day on a roof makes you appreciate the weight of one pound twelve ounces without the battery. Many of the different brands of cordless drills also offer the ability for there batteries to fit other cordless tools in that same brand, an example being Makita. Other makes also do the same. With the older corded drills they usually had only one speed and no clutch. You would get full torque with each press of the trigger. These days most brands provide a clutch on there cordless drills, which is used to prevent to much torque when driving screws or other smaller things. There is almost always a two speed setting, a low and high range. The slower for driving larger bits, as when your drilling to install a door knob, or even mixing paint. The higher speed for drilling smaller holes and other things. The chuck on most of these drills is tightened and loosened by hand. The Lithium ion battery pack can be charged at any time for the mastercraft drills, so there is no waiting for it to totally run out of juice. A fully discharged battery will take about sixty to one hundred twenty minutes for a recharge depending on the battery. If the battery is left on the charger it will not overcharge, so that’s something handy also. I hope the above information will give you some ideas on cordless drills, and which will be the best suitable for the projects you are working on. A handy tip for drilling holes is if you know the depth then just wrap some tape around the drill bit at the desired depth. Most of these drills come with a variable speed clutch, where you can set it at a low number for screws so as not to twist the heads off them, and a higher setting for drilling. The part of the drill that holds the drill bits is referred to as the chuck and comes in a 1/2 inch size which is used the most often, but some of the less expensive have a 3/8 chuck for light duty work. I wish you the best of luck on your drill shopping and any comments are appreciated.